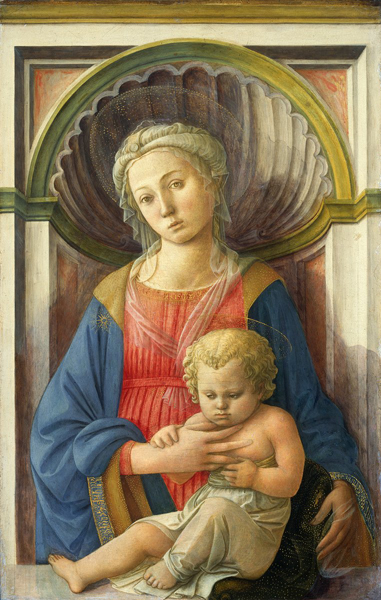 Production of small paintings of the Virgin and Child was the bread and butter of many Florentine artists and their workshops. Demand for domestic panels was great, part of a trend that saw an increase in household furnishings generally and was also reflective of the Virgin’s growing status, as greater numbers of lay people and theologians accepted the doctrine of the Immaculate Conception. An inventory of the household of Giovanni di Bicci de’ Medici as early as 1417 listed six paintings of the Virgin, together with five other sacred paintings and sculptures. A more modest inventory, of Bartolo Lippi’s effects from 1450, noted only forty items total, yet two were paintings of the Madonna. The gesture of the child, who pulls his mother’s hand toward his neck, suggests the sacrifice of the Lamb of God, a foretelling of his future on the Cross that is also glimpsed in the Virgin’s look of sad understanding. Filippo Lippi’s linear but expressive paintings made him one of Florence’s leading artists and earned the praise of sophisticated patrons like the Medici. Compare this work with Bellini’s (see Bellini’s Luminous Madonnas). While the light in Bellini’s paintings surrounds the Madonna and Child with a tangible atmosphere, this Florentine picture seems almost airless. 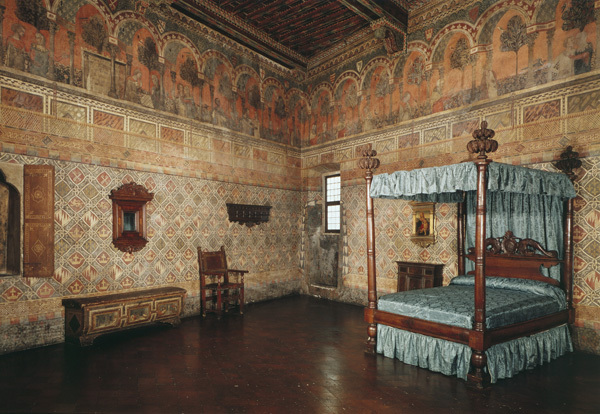 Some of the richest families had private chapels with paintings hung over their altars. Paintings served a similar function in less elaborate settings. An inventory of the Tournabouni in 1497, for example, identified a “little upstairs hall” where a trestle table was used as a portable altar, together with vessels and vestments and a painting of the pietà.15 But for the most part the connection between viewer and image was more personal than liturgical. Fifteenth-century Florentines did not simply own these images, in the way we might own art today. Rather, they engaged in an active interchange with them. Religious images, which both taught and modeled behavior, were readily accessible in the home to those who were deemed most in need of guidance, namely, women and young children (see “Advice for the use of religious images in childrearing”). Domenico Veneziano must have been born in Venice or had family roots there, but his activity as an artist and his style—concern with volume, energetic line, and warm interaction between mother and child—were thoroughly Florentine. Here the child seems to climb onto his mother, who inclines toward him, shifting from a frontal pose to angle her body to his. Their gestures and poses unite them even as she gazes past, considering perhaps his future suffering. He, on the other hand, looks out to connect with the viewer directly and immediately. 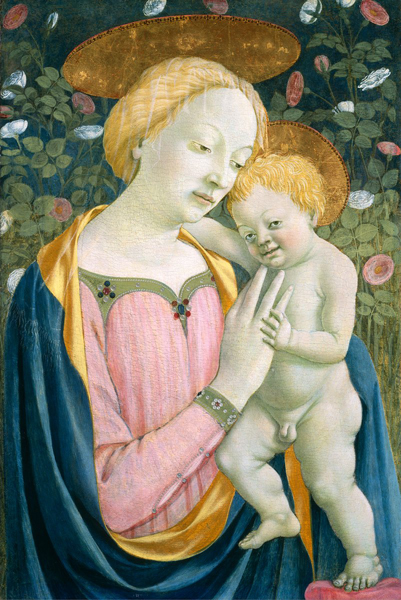 Roses, flowers associated with the Virgin, fill the background; they are thornless, perhaps alluding to Mary’s purity. Devotional art was meant, as one scholar has described, to be “instructive, moving and memorable—to aid beholders in turning their mind to God.”16 Images prompted and were part of specific routines spelled out in devotional manuals. Pictures were an aid, even a cue, for prayer; some paintings or frames were inscribed Ave Maria, gratia plena (Hail Mary, full of grace), words recited in the rosary and other prayers. Images also prompted memory and meditation on the lives of holy figures, and led, it was hoped, to their emulation. Lives of the saints, which were widely read, also indicated by example how images should be used. A life of Saint Catherine of Alexandria described an episode when a hermit told her to pray before the painting of the Virgin and Child he had given her in order that she receive a vision of the Christ Child. Images activated the spiritual imagination. The focus of this unit is on painted representations, but Renaissance citizens would have seen large numbers of sculpted images as well, both at home—if they were wealthy enough—and in public. Florentines walking in the streets would have seen reliefs set into the walls. They also embellished civic institutions and those sponsored by lay confraternities. 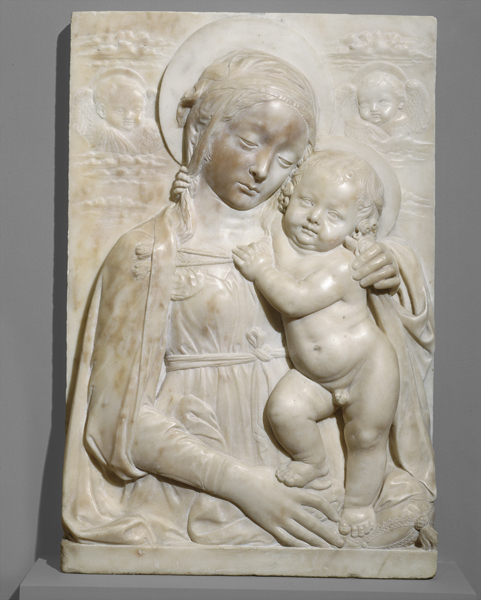 Using only very low relief, Donatello was able to present figures as if in deep space. 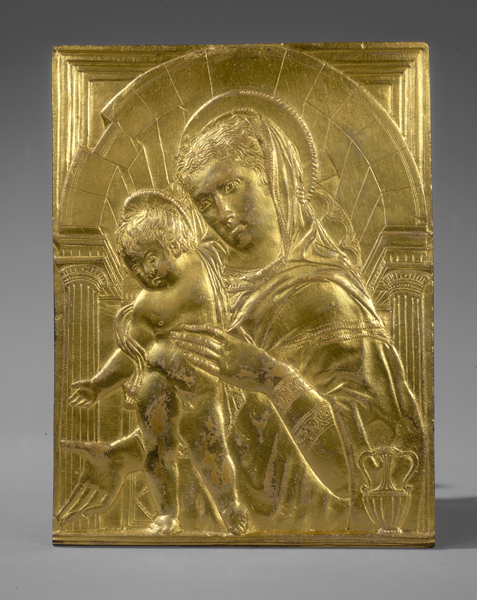 He produced reliefs in both marble and gilded bronze, like this one made by a follower. The parallel gestures of mother and child create a graceful movement, and the Virgin’s open palm invites the viewer to share their holy presence in a personal and direct way. Their pensive gazes suggest their contemplation of Christ’s future. 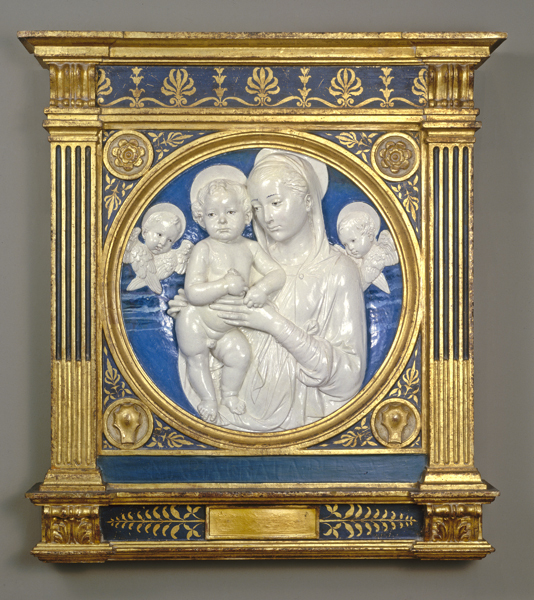 Andrea della Robbia took over the popular and profitable business of his uncle Luca della Robbia, who developed the technique of glazing terra-cotta reliefs. The brilliant glazes in blue and white (sometimes multicolored in garlands of fruits and leaves) were striking and quite durable, making the reliefs much in demand for homes, church interiors, and outdoor shrines. This Madonna was apparently presented with offerings, as most probably were; diaries record presentations of flower garlands and other adornments to paintings in the home. Small holes probably allowed family members to attach jewelry at the Virgin’s neck and wrist (possibly accounting for the awkward flatness of her right hand). 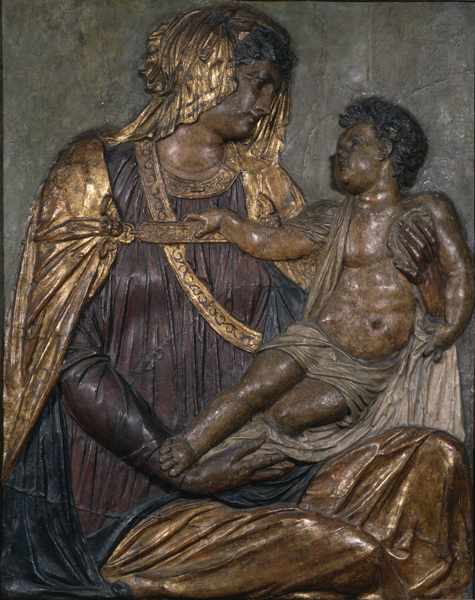 Notice how Benedetto da Maiano’s child pulls at the cords of his mother’s cloak and holds on to her hair and veil. The touching gestures combine with the softness of the carving to impart tenderness and warmth to the stone. 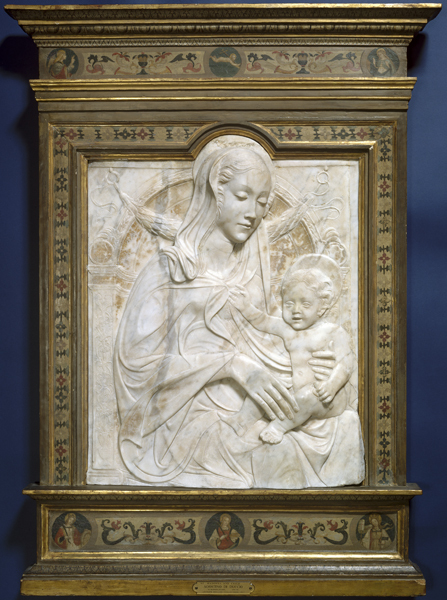 Benedetto’s marble reliefs served as models for many artists working in various media, including marble, bronze, paint, stucco, and terra-cotta. The stucco and papier-mâché relief by Jacopo Sansovino is a rare survival.